The media in Bangladesh is aggressive and vibrant. Journalists often play a bold role in exposing corruption and wrong-doings in the society. Their brave work earns them public admiration, but it also exposes them to threats on their life, harassment and insecurity. Safety of journalists has become a concern in the country. Incidents of attacks on journalists are rising. According to media rights groups at least 30 journalists and bloggers have been killed in such attacks since the country’s independence in 1971. In most cases killers and attackers went unpunished. Even in most cases the motive of killing and attacks was not clear. 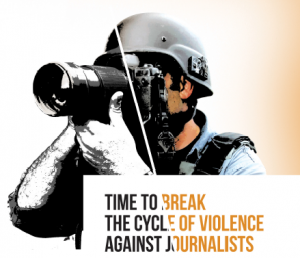 The violence against journalists and media has increased globally. 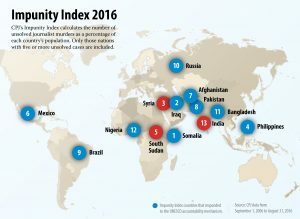 International media monitoring organisation Committee to Protect Journalists (CPJ) has identified 20 deadliest countries for journalists. 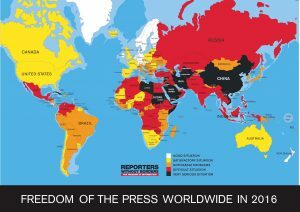 Bangladesh is one of these countries, where freedom of press and freedom of expression is under serious threat. Reporters Sans Frontiers (RSF) notes the ‘dangerous situation’ for journalists in Bangladesh, ranking the country 146th among 180 countries in its Press Freedom Index 2017. UNESCO released “New Fronts, Brave Voices: Press Freedom in South Asia 2016-17” on the occasion of the World Press Freedom Day on May 3, 2017. The report prepared by the International Federation of Journalists (IFJ) documents the “deteriorating press freedom situation, media rights issues, and national and regional activities to empower journalists to confront the challenges relating to press freedom of South Asia over the past year”. Across South Asia, journalism has always been a tough profession. Its diverse terrain for media workers is ever challenged by the complex socio-cultural and political dynamic that also weaves it together. Out in the field, in local and regional beats as well as on high-profile political trails, journalists and media workers are too often exposed to the dangers this volatile mix presents. As the numbers of incidents recorded by the IFJ and its affiliates show, they are exposed to threats, violence or intimidation in a bid to silence. For too many, it takes the highest price – life. Almost 90% of the victims in 2014 – 2015 were local journalists, confirming a trend observed throughout the last decade. To face the challenges against press freedom and freedom of expression and defend those News Network, with the support of UNESCO, has undertaken the project for safety of journalists aiming to make them aware about the safety measures and also ensure a constructive engagement of concerned stakeholders and people_ individuals or organizations _ involved in advocacy to create a safe field for journalists and media houses. To strengthen the environment for press freedom, journalistic safety and/or self-regulation, for on-line and/or off-line media, through favorable policies and/or practices. To promote good governance and transparency by developing pluralistic media institutions, including community media, and/or by building media professional capacities. The project will give focus to (i) Build awareness of safety measures when reporting from danger zones; (ii) Analyse cases of violence against journalists to examine how they might have been avoided; (iii) Educate journalists about the risks of investigative journalism and political reporting; (iv) Educate journalists about existing resources in Bangladesh for journalists facing hostility; (v) Train journalists to report on crimes against journalists. The initiative shall also establish a peer network for monitoring crimes against journalists and advocating journalists’ safety in Bangladesh. News Network believes that the safety of journalists must be addressed both as a human rights issue in itself and as a foundation for press freedom. The journalists who will participate in this programme will continue the initiative as part of their professional and social responsibility. They will share their learning with their colleagues and friends within their organizations and outside. The peer network / advocacy group is expected to monitor and promote the safety of journalists well beyond the project period.